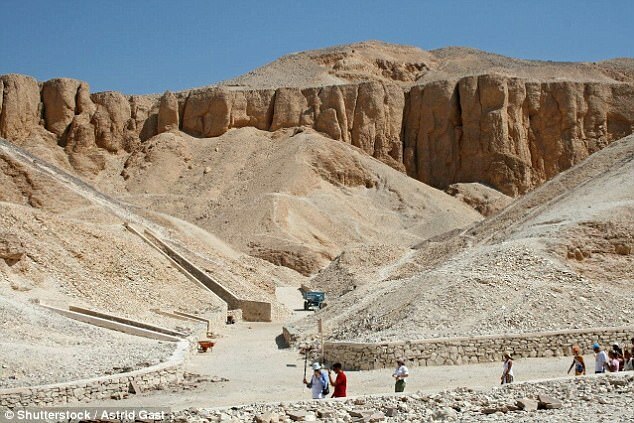 The mystery of the final resting place of the wife of Ancient Egypt's most famous ruler has moved a step closer to being solved. 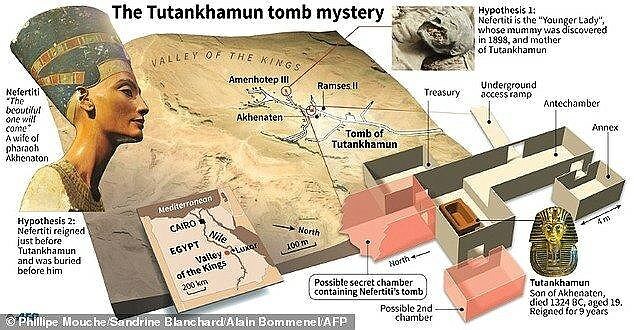 Egyptologists previously discovered what they believe is the burial chamber of Ankhesenamun, Tutankhamun's wife, in the Valley of The Kings. The teen bride is believed to have had a tragic life, marrying her father, her grandfather and her half-brother Tutankhamun. Archaeologists have now begun to excavate an area near a tomb at the World Heritage Site, which they believe contains her body. Archaeologist and former Egyptian minister for antiquities, Zahi Hawass, announced the start of the dig on his website. He discovered the suspected burial plot near the tomb of the pharaoh Ay in July 2017, using ground penetrating radar. In a written statement, a spokesman for Hawass' research team said: 'In January 2018, Zahi Hawass launched his own excavations at the Valley of the Monkeys, a side valley in the area of the Valley of the Kings. 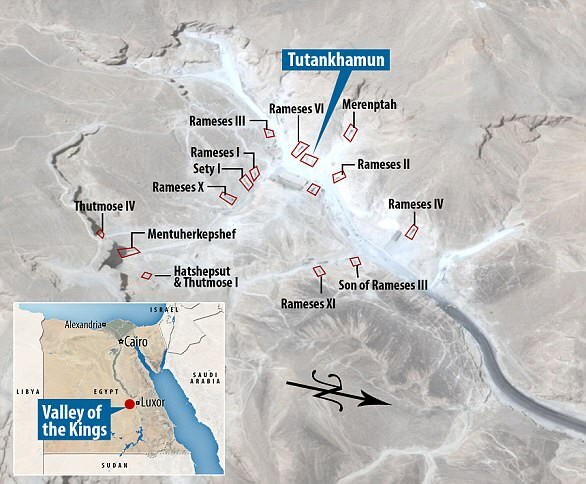 'The focus of the excavations is in the area in close proximity to the tomb of Ay, Tutankhamun's successor. 'The radar scans in the area detected the presence of a possible entrance to a tomb at a depth of five metres (16 feet). Hawass' team plan to excavate the newly discovered chamber to determine exactly who is inside. Speaking to LiveScience at the time of its discovery, Hawass said: 'We are sure there is a tomb there, but we do not know for sure to whom it belongs. 'We are sure there is a tomb hidden in that area because I found four foundation deposits. 'The ancient Egyptians usually did four or five foundation deposits whenever they started a tomb's construction. The wife of Ancient Egypt's most famous ruler may have been uncovered in the Valley of The Kings. World renowned archaeologist and former Egpytian minister for antiquities, Zahi Hawass, uncovered the burial plot near the tomb of the pharaoh Ay. The team plan to excavate the newly discovered chamber to determine exactly who is inside. Ankhesenamun was the third child of Pharaoh Akhenaten and Nefertiti and was born in around 1348BC. She was originally called Ankhesenpaaten, but her change of name reflects changes in Ancient Egyptian religion during her lifetime. She was the half sister and cousin of Tutankhamun, with the pair sharing the same father. Tutankhamun's mother, believed to have been Nefertiti, is thought to have been Ankhesenamun's aunt. 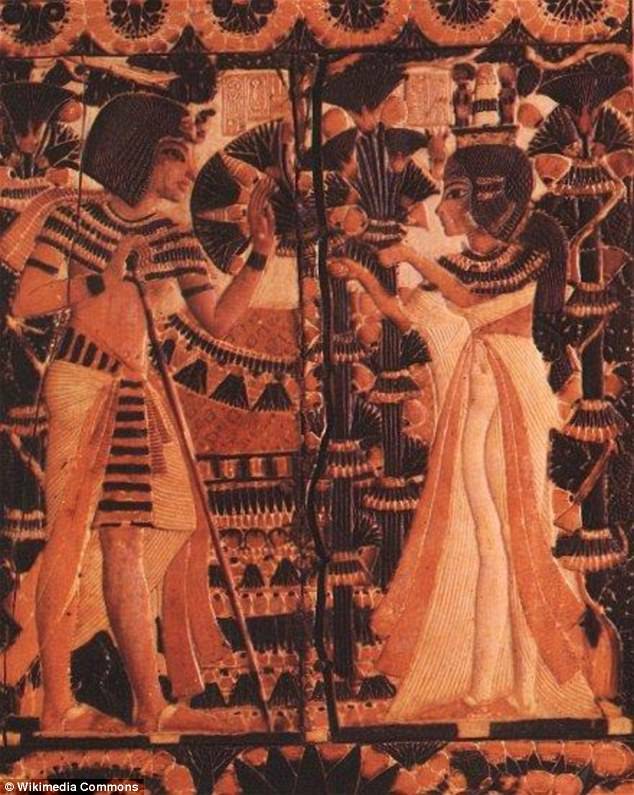 The queen is said to have married King Tut when he took the throne at the age of nine, when she was just a few years older. After their marriage the pair changed their names in honour of the old monotheistic religion that they reverted back to. Some records suggest she married her grandfather after the death of King Tut. Others that she was briefly the wife of her father beforehand. 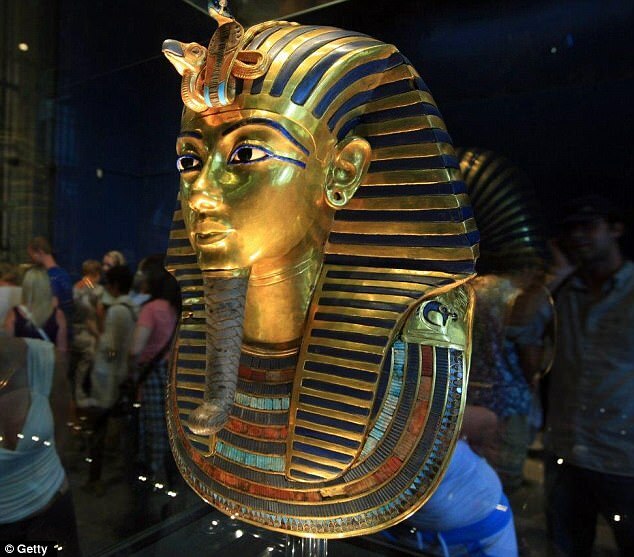 King Tut became pharaoh in around 1332 BC and ruled for just nine years until his death. Tutankhamun's significance stems from his rejection of the radical religious innovations introduced by his predecessor and father, Akhenaten. When King Tut was aged 12 the backlash against the new religion was so intense that the young pharaoh changed his name from Tutankhaten to Tutankhamun. A year later, the royal court moved back to the old capital at Thebes, now called Luxor, which was the centre of worship of the god Amun and the power base of the Amun priests. King Tut is considered a minor phaorah. The Valley of the Kings in upper Egypt is one of the main tourist attractions of the country, next to the Giza pyramid complex. However, his fame arose when his tomb was found in 1922 by Howard Carter. It was almost intact and remains the most complete ancient Egyptian royal tomb ever found. And the tomb continues to reveal hidden secrets even today. In February 2017, archaeologists announced plans to resume the search for lost burial chambers in King Tutankhamun's tomb. The news follows more than a year of speculation after British Egyptologist, Nicholas Reeves, said he found signs of a hidden doorway in King Tut's tomb. 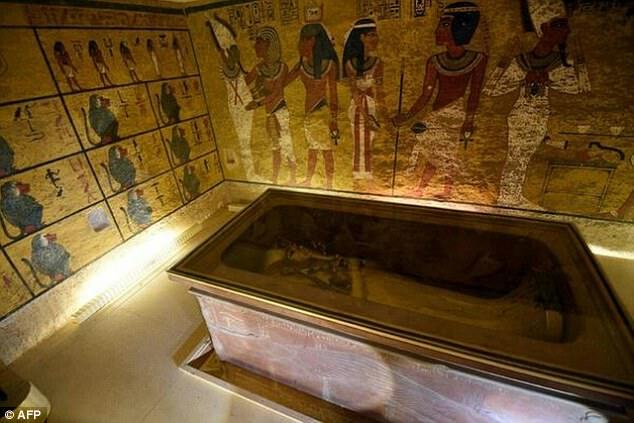 At the time, he said one of the secret rooms could be the burial place of Queen Nefertiti. A team now plans to use radar systems to scan the 3,300-year-old chamber. The search will be led by the Polytechnic University Turin, Italy and will be the third team in the past two years researchers have looked for the lost chamber. Mamdouh Eldamaty, Egypt's former antiquities minister, said there is a '90 per cent' chance the tomb has hidden chambers. He claims that and finding them would be the 'discovery of the century'. WERE KING TUTANKHAMUN'S PARENTS ALSO COUSINS? 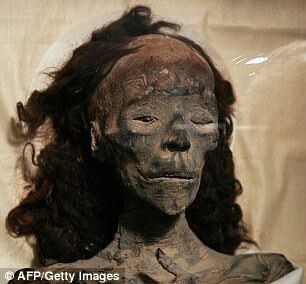 In 2010 DNA testing confirmed a mummy found in the tomb of Amenhotep II was Queen Tiye, the chief wife of Amenhotep III, mother of Pharaoh Akhenanten, and Tutankhamun's grandmother. A third mummy, thought to be one of Pharaoh Akhenaten wives, was found to be a likely candidate as Tutankhamun's mother, but DNA evidence showed it was Akhenaten's sister. Later analysis in 2013 suggested Nefertiti, Akhenaten's chief wife, was Tutankhamun's mother. However, the work by Marc Gabolde, a French archaeologist, has suggested Nefertiti was also Akhenaten's cousin. However, his claims have been disputed by other Egyptologists, including Zahi Hawass, head of Egypt's Supreme Council of Antiquities. His team's research suggests that Tut's mother was, like Akhenaten, the daughter of Amenhotep III and Queen Tiye. Hawass added that there is 'no evidence' in archaeology or philology to indicate that Nefertiti was the daughter of Amenhotep III.